Our dedicated Team makes a difference. Passion for real estate is the foundation for what we do. New Winds Realty is one of the largest and most respected real estate specialists in Curacao. Our organization started its activities in 1989 on St. Martin as a real estate developer. Real estate projects in prime locations on St. Martin were all actively and efficiently carried out to the complete satisfaction of the current owners. 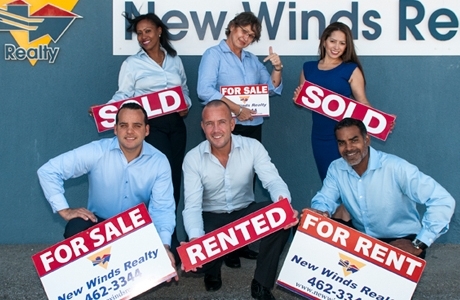 In 1992, New Winds Realty continued its activities in Curaçao and expanded its qualified staff to provide the best possible service on the island. We offer the most complete and comprehensive portfolio of services, as well as real estate developer and broker. The New Winds Realty team consists of experienced professionals who are motivated and happy to provide you with service, advice and assistance on a personal level when it comes to real estate. Whether you are planning to buy, lease, sell, rent, develop or invest, we are here to help you. New Winds realty is at home on all real estate playing fields. Our mission is not to sell or lease real estate. Our mission is to provide full high quality service in everything related to real estate. The best you can get. Up right and professional. So you, feel at home. Curacao's real estate market seems to be saturated by "brokers" who offer their "services". The market is constantly changing and at an accelerated pace. We continuously monitor the market so we know what is going on. As a consumer, you are very critical and want accurate and efficient action, so you can get where you want to be quickly and effectively. This is what New Winds Realty stands for. A satisfied, durable and solid client-base. For more than 22 years. they say it. we do it.